Forecasts of slowing economic growth have been the norm for some time, but it is easy to sense greater confidence lately among those making them. Fannie Mae's March Economic Developments report is predicting growth will slow from 3.1 percent in 2018 to 2.2 percent over the course of this year. The company's economists see the boost from the Tax Cuts and Jobs Act fading, business investment and consumer spending slowing, and a number of other factors, including several global ones and others related to trade. They also see the risks to their forecast being primarily on the downside, although some of those risks have lessened over the last month. There have been some negative milestones in recent months. Personal consumption expenditures slowed from 3.5 percent in the third quarter to 2.8 percent in the fourth due to December's decline in real consumer spending, the largest in more than nine years. Household financial assets declined in December for the first time since 2015. The U.S. trade deficit hit a 10-year high of $59.8 billion in December, driven by a surge in imports while exports posted the largest monthly decline in nearly three years. The February jobs report indicated that the economy added 20,000 jobs, a sharp decline from the upwardly revised 311,000 jobs added in January and the slowest pace of job growth since September 2017. Despite the poor rate of job creation in February, the employment situation remains solid. Wages rose 0.4 percent in February and 3.4 percent on an annual basis, the best growth of the expansion. 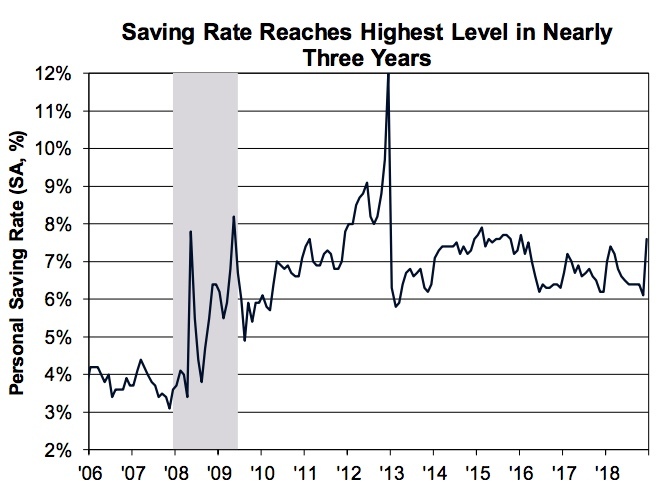 The increase in wages and a drop in spending contributed to a 1.5-point increase in the savings rate to 7.6 percent, the highest level since January 2016. Productivity rose by 1.8 percent annually in the fourth quarter, breaking out of the 1.0 percent to 1.4 percent range that has prevailed since the end of 2016. Faster productivity presents upward potential for broader economic growth. Inflation remains muted and with the Federal Reserve announcing it would be "patient" about future rate hikes, Fannie Mae has pushed back its expectations for the next one. They now expect the Fed to hold steady until the fourth quarter rather than mid-year as they previously predicted. They add, if downside risks continue to dominate there probably won't be any increase in 2019. Home sales remain soft compared to a year ago. Annualized existing home sales were down 8.5 percent in January to 4.94 million, the lowest since November 2015. New home sales were down 2.4 percent year-over-year in December (and 4.1 percent in January). 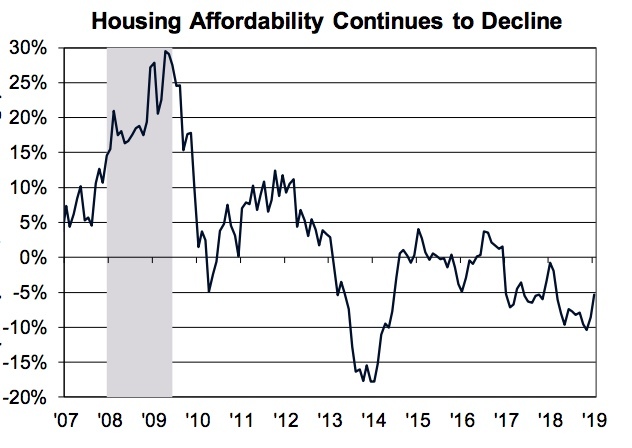 The National Association of Realtors' Housing Affordability Index shows that home buying affordability declined on a year-over-year basis in January for the 25th consecutive month however things have improved slightly in recent weeks. Contract rates on 30-year mortgages fell in February to a monthly average of 4.37 percent, the third consecutive monthly drop. And the S&P Case/Shiller National Home Price Index indicated that annual appreciation decelerated to 4.7 percent, the slowest pace of growth since September 2015. The Housing Vacancy Survey reported that household formation increased by 1.5 million units year over year in the fourth quarter of 2018 as a sharp expansion in the number of owner-occupied households over the quarter offset a small contraction in renter households. In addition, pending home sales rose 4.6 percent in January, suggesting that closings on existing homes should experience growth in the coming months. Prospects for housing demand remain favorable, but several recent releases suggest that some momentum has been lost. Following a surge in January, average monthly purchase mortgage applications fell 10.3 percent in February to a level 1.1 percent above the December reading, suggesting more modest growth in home sales at the beginning of the year than was anticipated last month. Inventories have been increasing, but still remain far below the 6.0-month level that is considered a balanced market. The supply of existing home was 3.9 months in January. The inventory of new homes was unchanged in December at 7.8 months for the third month and a 25.1 percent increase in single-family housing starts in January may mean a greater supply of new homes in coming months. Fannie Mae's economists say they continue to expect home sales to hold steady in 2019 at about 2018 levels but they have lowered their forecast for the first half of the year because of the decline of purchase mortgage applications. They expect that a portion of those sales will be recaptured in the second half if mortgage rates remain low. The downward revision in sales led to a lowering of predictions for purchase mortgage originations from $1.181 trillion to $1.176 trillion. This will be a 2.7 percent increase from 2018 rather than the 3.0 percent forecast last month. Refinance originations were lowered from $431 billion to $417 billion in response to a 4-basis point increase in the projection for mortgage rates in 2019 and are now projected to shrink by 8.6 percent in 2019 from their 2018 level, steeper than the 6.5 percent decline projected in the February forecast.